Birdies Crazy Golf first appeared last year at The Vaults under Waterloo; now they're back for summer 2016 with a rooftop course on the top of a multistory carpark in Stratford, E15. 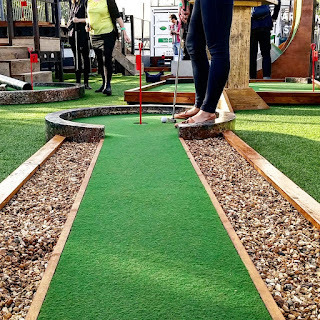 Expect crazy holes (one of which has a 5ft drop), great views, and streetfood from people like RockaDollar Dogs, plus cocktails and other drinks. It's open six days a week - closed Mondays - and it's only £9 for a ticket to play. 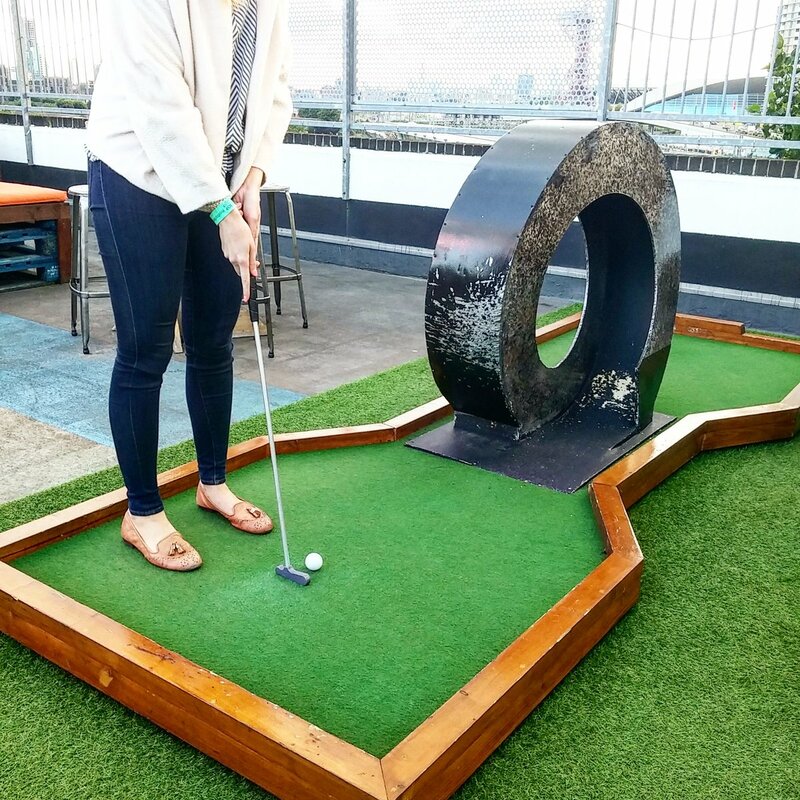 "London’s sell-out subterranean golf experience, Birdies – visited by more than 15,000 budding putter-punks in November and December last year – will make a triumphant return to the lofty greens of Roof East, high above the streets of Stratford this Summer. Birdies Rooftop Crazy Golf, from the kings of pop-up cinema Rooftop Film Club, promises a Summer season of crazy golf with altitude, delectable cocktails from mixology masters Spirited Mixers, a new lip-smacking menu of RockaDollar Dogs from Hawksmoor Knightsbridge Head Chef Richard Sandiford and a swinging schedule of resident DJs, all whilst enjoying London’s sun-drenched skyline. Open from 2pm at weekends for families and early birdies all the way to 10pm for golfing night owls. 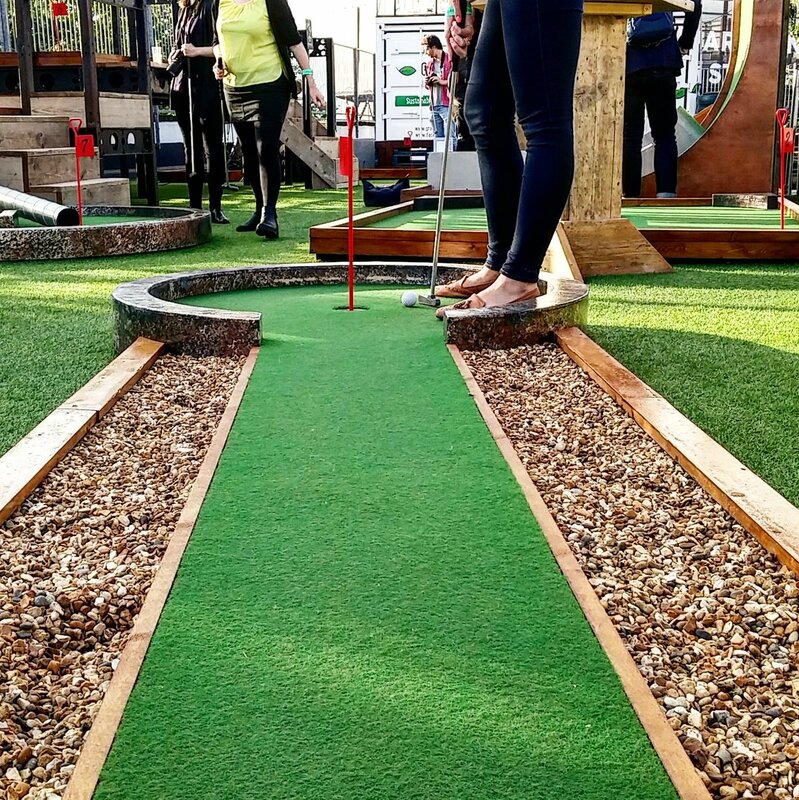 A challenge for even the most confident of swingers, the bespoke nine-hole course, serves up loops, half-pipes, hidden putt-off prizes and an elevated 5ft drop onto the sixth hole."